Hey everyone! It is time for Advent: Jesus Storybook Bible AND Journal Through The Bible! I can’t wait to share it along with a few other exciting things with you! After much urging and begging on my part, I finally wore down the hubby and we I began decorating for Christmas immediately following Halloween. I just couldn’t wait. If I had my way, the tree would come down in January and back up in February. LOL! Where was I? Right! Decorations! Hubby climbed into the attic and brought down all the decorations. I could hardly wait to get my hands on the ornaments, the lights, the Nativity scenes, and all the other Christmas decorations we have kept all these years. Each decoration flooded my mind with sweet memories. Our first ornament together as a married couple. There’s the ornament we got during our trip to (fill in the blank). The old Mr and Mrs Clause passed down to me from my grandmother. So many fond memories. I love everything about Christmas. The sounds of Christmas music, the decorations, the lights twinkling in the house, the soft effervescent glow of the tree topper star. I could sit and look at the tree all day long! One thing that I love the most about Christmas though is Advent. Preparing my heart for the coming of my Savior is such a wonderful feeling. A few months ago, September to be exact, I introduced a Journal Through the Bible series. Now I get to share Advent: Jesus Storybook Bible AND Journal Through The Bible! If you’ve been writing through the Bible with me, I hope it has been as wonderful for you as it has for me. It has helped me remain accountable in my time with God. This month, we will continue this series with a twist as I introduce Writing Through the Bible for Advent. I have received requests for Write Through series for kids, too. 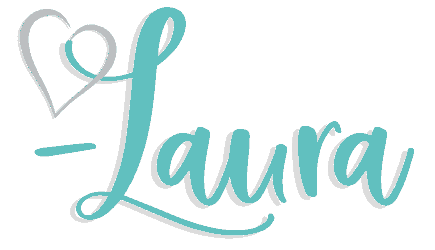 I have exciting news! In addition to the monthly Write Through the Bible series, I decided to share how to use the Jesus Storybook Bible for Advent with your children. Why the Jesus Storybook Bible? 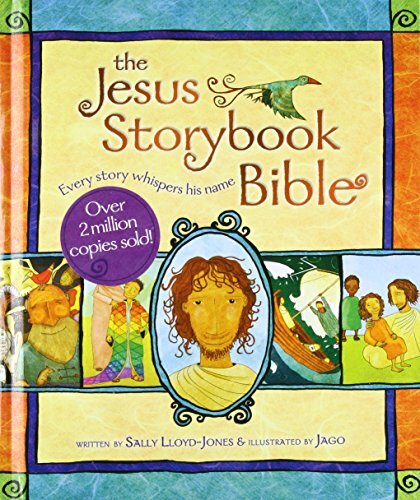 In the Jesus storybook Bible, every story whispers his name. The stories are beautifully written with absolutely breathtaking illustrations. Simply put, the book is inspiring. One thing that fascinates me about this storybook for kids is that there are 21 stories from the Old Testament included. Each story ties into the imminent birth of Christ! Then there are three stories that lead you right into and surround the birth of Jesus. This is perfect for Advent for Children. Using this storybook and my Advent reading plan is a GREAT way to simplify things during the Advent season! There isn’t anything to cut out, no messes, and it is a good way to just cuddle up and slow down for a few minutes to reflect on the reason for the season. If you are looking for a way to start developing a habit of reading together as a family, Advent is a great time to start! The countdown to Advent will begin soon. However, we will wait until December 1st to begin ours. However, I know the hustle and bustle this time of year is hectic, so I wanted to get the scripture verses for December up on the site as soon as possible. If you have NOT downloaded your copy of the study- Advent: Jesus Storybook Bible AND Journal Through The Bible!…GO HERE now! It is FREE!!!! As an added bonus, I have another tool I want to quickly share with you that will bring to life your journaling. I recently was blessed with an opportunity to review the Bible Journaling Kit through Propeller Entertainment. Create a work of art on the pages of your favorite Bible. Draw, color, or journal your thoughts, dreams, and prayers. 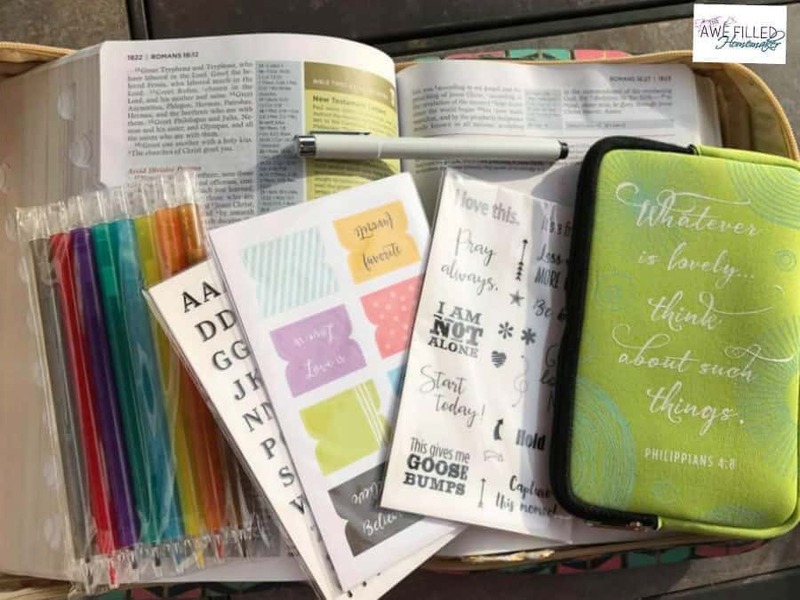 Highlight your favorite verses or the encouragements that speak to your heart with pencils, stickers, and tabs. This kit is absolutely wonderful! This year it seems that art work, Bible journaling, and adult scripture coloring has arrived with a bang! Anything that can help to hide God’s Word in your heart is a blessing! As an additional blessing, the author and Propeller Entertainment is giving me an extra kit to bless a lucky reader! Don’t procrastinate and head down below and enter the giveaway! If you want more chances to win, Ellie Claire is also having a giveaway! Light your candles. Prepare your heart. 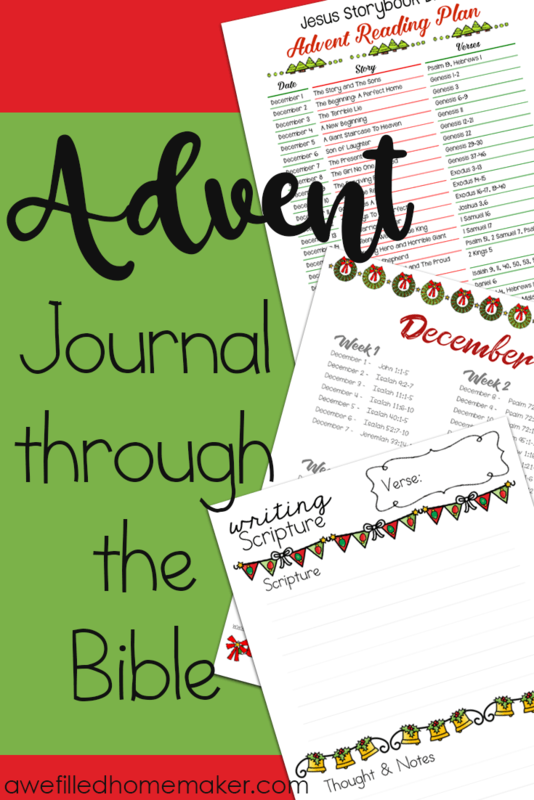 Enter the giveaway and come Journal Through the Bible this Advent season with me. I also have a Facebook group for my Journal Through the Bible series. I would love to see you there. Don’t forget to grab your Advent study! Again it is FREE! What age would you say this is best for?